Get In, Get Out, Get it Done! Let’s face it, we’re always running out of time. Every hour seems to tick by faster and faster and finding time to get to the gym becomes a challenge. So, being efficient and focused as you step through the doors of the gym is paramount. If you can actually save time and reach your goals that would interest you wouldn’t it? So, the ultimate question here is, “Can you provide the same stimulus in a 30 minute workout as you can in 60?” The end result is it's all about building strong, powerful, hard muscle—it always has been, always will be. Please don't let 'em tell you otherwise. Let's learn how to Maximum Muscle Growth In Minimum Time. Since the dawn of weight training, to this day, muscle size still matters, and nothing beats a rock-hard, chiseled physique. Hard + muscular + strong = respect. Although packing on those pounds of hard muscle is not rocket science, it isn’t exactly easy. You know that. Building your own suit of armor takes work—that's right, we said it. It takes work … That's why, even today, with all of our scientific advances and technical achievements, results often come down to something as primal and simple as "lift something heavy… do it again… and again… and again, until you can't do it anymore." But, with today's modern lifestyle, you've got only so much time to get the work done. Don't get us wrong, though. We believe training might as well be fun, too, right? After all, you're devoting your time and effort to it. But first, let's set down the ground rules. High intensity is the secret to maximizing gains in growth, hardness, and strength. Lift heavy things, take short rest periods in-between sets, and keep the volume high. Why? Because higher volume resistance training has been shown to stimulate the most dramatic rise in levels of the key anabolic (i.e., muscle-building) hormones. Blood levels of growth hormone and testosterone increase significantly when the body is stimulated by maximal heavy resistance exercise, compared to the hormonal response of lower intensity resistance activity. "High intensity is the secret to maximizing gains in growth, hardness, and strength. Lift heavy things, take short rest periods in-between sets, and keep the volume high." Also, resistance training that utilizes maximal explosive reps to failure also results in significant anabolic hormone level spikes. Higher workload over time also has been shown to have a relatively positive impact on anabolic hormone levels. Research has shown that short duration, high-intensity, high-volume training seems to be the Holy Grail for maximum anabolic response. This is the formula shown to elicit the most dramatic hormonal response to training. Make sure that when you implement this program of high intensity, short rest and large multi-joint movements that you are fully prepared before, during and after training. Multi-Time World’s Strongest Man Brian Shaw is meticulous in his preparation. He insures adequate protein intake by eating 5 pounds of meat per day (he is 6’8” and 430 pounds), and a minimum of 4 servings of 100% BIO-ACTIVE WHEY each day. 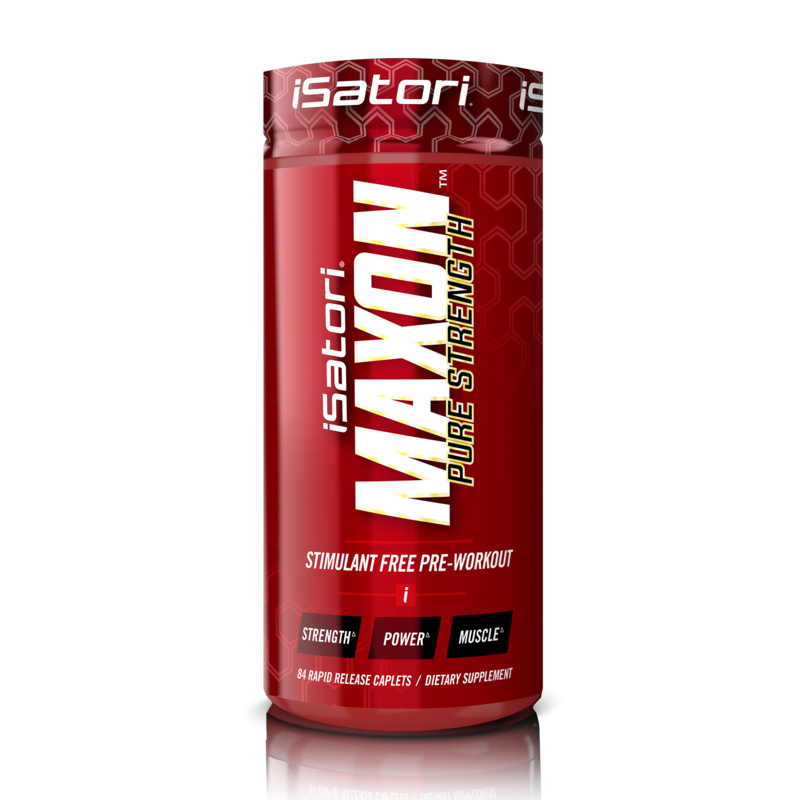 His pre-workout ritual is 3 scoops of PRE-GRO™ MAX with 8 MAXON™ PURE STRENGTH tablets. 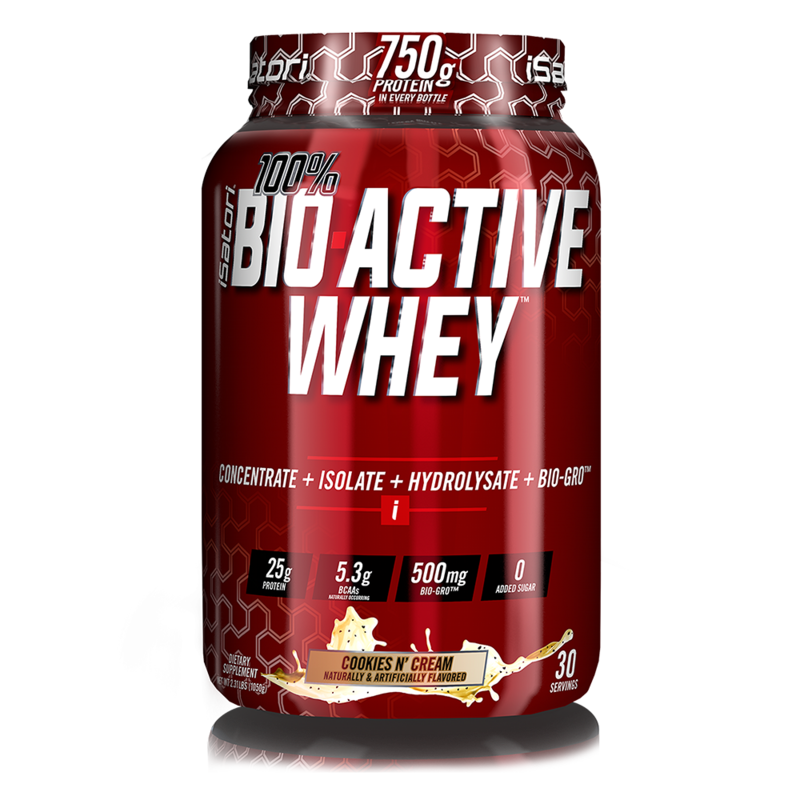 This stack ensures Brian is maximizing his strength and recovery on every single rep. Post workout Brian slams down his 100% BIO-ACTIVE WHEY shake with 3 scoops of added BIO-GRO Bio-Active Peptides to help speed and maximize his recovery. Brian has also recently added ISA-TEST® GF to his plan to help maximize his useable testosterone while helping to minimize estrogen. Due to Brian’s size, he doubles the recommended dose. 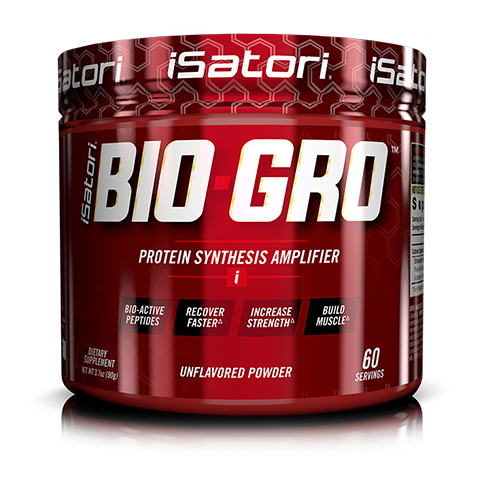 ISA-TEST GF fits perfectly into this type of training program as the goal is to illicit a maximal hormonal response with this high intensity, short duration training. Find out more about ISA-TEST GF here. In contrast, prolonged, lower intensity, sustained physical activity can tend to push a body toward catabolism, or muscle breakdown—exactly what we don't want! What this all boils down to is you need to work out hard and heavy but not for too long. Which is exactly how most of us want to train! Ah, the all-too-familiar sensation of that fiery ache deep within the belly of the muscle; painfully sweet sensations of fiber-splitting engorgement as nutrient- and oxygen-rich blood pump into the sarcoplasm, stretching the cell membrane until its insides threaten to burst—that's where you want to be, deep inside the "mind in the muscle." Make it BURN! This is momentary muscular failure. Focus on the burn; push that muscle until it can no longer contract. And if you're brave enough to do so, enduring discomfort and ignoring that little voice inside your head, telling you to "be careful, not to hurt yourself"… if you can keep those muscles fighting gravity's pull against the weight, you will win! Hit that point where the muscle absolutely refuses to respond, will not fire, cannot contract another inch! That's the point of momentary muscular failure. At that point, the biochemical switch is flipped, and all kinds of cool things happen at the cellular level. You'll have achieved a small victory, where a cascade of biological processes occurs that send you down the road to bigger, harder, stronger muscles. For even greater gains, incorporate some explosive training into your workouts. How? Simple. Choose a weight that will allow one single set of 12 to 15 repetitions at a normal rep cadence, pace, and speed. But instead of performing normal speed reps, each rep will be a controlled acceleration through a complete range of motion. Push the weight aggressively and rapidly through the entire positive (concentric) phase of the movement, attempting to accelerate the weight through the entire range of motion. It doesn't matter if you're a man or woman, this type of training will help you build maximum results fast! No, you won't "fling" the weight. Rather, think aggressive "push!" Think of it like "punching" through the range of motion. Like with a punch, you push as hard as you can, against a moderately heavy resistance, but do it with strict, controlled form. Each rep is strong, purposeful, and rhythmic yet with a forceful cadence. This "explosive rep" technique is performed to the count of "up-1, 1-2; up-2, 1-2; up-3, 1-2" as you push aggressively against the resistance during the concentric phase of the movement, and then slowly lower the weight for a two-count during a controlled eccentric phase. Every set is taken to failure during this program. Now You're Ready to Hit the Weights! After a thorough warm up and light stretching of the muscles to be trained, choose weights that allow you to perform the prescribed exercises with proper form, for the specified reps. The goal is to reach momentary muscular failure at the last one to two reps. Be sure to maintain rest intervals as prescribed. Push yourself. The pace you set will determine the results you get out of this program. So set your "stop-watch," and let's get to it! Move fast, breathe deeply, keep weights heavy, but keep use perfect form. Pay close attention to your strength levels at this point. You'll likely be surprised at how quickly your strength will improve as your body adapts to the training program. 100 reps—choose a weight that allows for 20 to 25 reps. Complete as many reps as possible, re-rack weight, pause for two deep breaths, then continue. Keep on in this way, rep to failure, pause for two deep breaths; continue like this until 100 reps are complete. Training in this way will help maximize hormonal output, improve strength, and stimulate maximal adaptive response for optimal gains in size and lean body mass. Follow Phase 1 for 2 weeks, and watch your body change. After completing Phase 1, you'll be ready to take it to the next level. Try Phase 2, for weeks 3 to 6 of this 6-week program, and watch what happens to your physique! "Training in this way will help maximize hormonal output, improve strength, and stimulate maximal adaptive response for optimal gains in size and lean body mass." This new-age, high-performance training protocol was designed to optimize the body's own adaptive, anabolic response to specific types of exercise, stimulating maximum muscle growth in less than 50 minutes each day. It's challenging! But that's a part of what makes it fun! Follow the six-week training program as outlined, stay on track with the time-parameters, and get started earning your own "walk around muscle"! Crewther, B., Cronin, J., Keogh, J., Possible stimuli for strength and power adaptation: acute hormonal response Sports Med. 2006;36(1):65-78. Goto,K, Ishii N, Kizuka, T., Nagasawa, O., Takamatsu, K., Muscular adaptations to combinations of high-and-low-intensity resistance exercises. Journal of Strength and Conditioning Research 2004 Nov:18(4):730-737. Goto,K, Ishii N., Kaneko, T., Kizuka, T., Takamatsu, K., Relationship between magnitude of acute hormonal responses and muscular adaptations during resistance training. Med Sci Sports Exercise. 36(5), Supplement abstract 2085. Linnamo, V., Pakarinen, A., Komi, P.v., Kraemer, W.J., Hakinen, K.J., Acute hormonal responses to sub maximal and maximal heavy resistance and explosive exercises in men and women. Strength Cond Res. 2005 Aug;19(3):566-71. Ratamess, N.A., Kraemer, W.J., Volek, J.S., Maresh, C.M, et al., Resistance exercise volume on post-exercise androgen receptor content in resistance-trained men. Med Sci Sports Exercise, 2005, (36(5) Supplement abstract. 1659. Tarpenning, K.M., Wiswell, R.A., Hawkins, S.A., Marcell, T.J., Influence of weight training exercise and modification of hormonal response on skeletal muscle growth. J Sci Med Sport, 2001 Dec;4(4):431-46.